Upright 300 gallon tank for better sight lines around tank. Fork Lift Type High Lift System. Heavy Duty Telescoping Tongue . Adjustable from 56' to 102' wheel centers. Folding steps for easy tank filling. Reversible axles and hitch for planting on beds. Optional shelves for both sides of tank. Two Model 1000 direct drive transplanters. Shown with optional poly double disc shoes, cushion seats, rubber packer wheels and 7:60 x 15' tires. 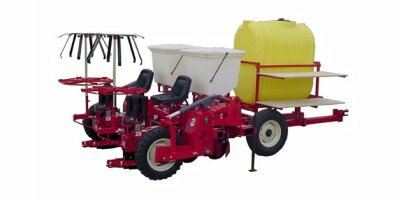 Our fertilizer attachment comes one to eight rows with an individual 300# plastic hopper and a pair of single disc openers for each row. 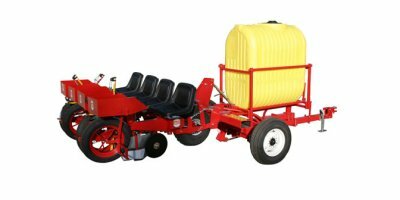 The fertilizer is driven by our deluxe roller chain gauge wheel drive system. 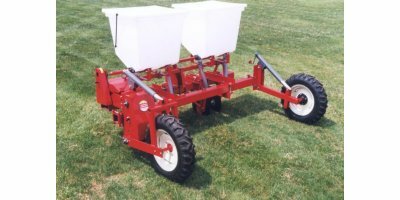 The Fertilizer hoppers and disc openers are mounted to a front toolbar and the planting units to a second bar to allow for more flexibility in row spacing. The Model 92B shapes a 4' high bed and lays plastic in one operation. The Model 94 special design allows the farmer complete control of the depth of bed up to 8'. Widths from 24' to 40', and can form either a flat or crowned bed. A Planter that does the job at an affordable price. Can be used with small tractors. Adjustable axle eliminates the need for strawberry extensions. UHMW Rollers on all V-3 pockets allow for less friction and longer wear. Shown with optional rubber packing wheels. See our optional equipment page for other options. Our No-Till Attachment can be bolted on to Mechanical Transplanter Models 1000, 5000WW and 6000. It has a spring-loaded coulter and subsoil tooth to open the soil. A poly double disc shoe and narrow flat wheels should be added to the transplanter to complete the no-till setup. Come complete with one toolbar, four setback arms, coulter and tooth. The Model 33 6000 transplants up to 3' round or square peat pots or large cells as fast as 60 plants per minute. The 12 pocket chain allows for fast and effective plant placement and a wide variety of plant spacings. The Model 900 Mulch Transplanter is designed to set peat pots, cell type plants, and Jiffy 7's, among others, into plastic mulch. The Model 900 accurately pierces the plastic, spaces, waters and packs the plants better than planters of similar type. The NEW Model 912 Mulch Transplanter is designed to have more accurate depth control and a wider range of plant spacings than other mulch planters and water wheels. Operators hands stay free of water and chemicals while sitting in an upright and comfortable position. The Model 948 Mulch Transplanter has the same features as the above 912 with plants spacing capabilities of 14', 17', 22', 27', 44' and 86'. 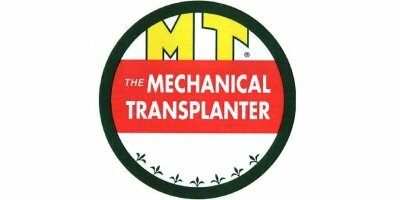 The Mechanical Transplanter 525 is an excellent close spacing bed transplanter that works well in any soil condition. Even in previously unplantable conditions, our exclusive Float Wheel Direct Drive system provides positive plant spacing without wheel slippage. The Mechanical Transplanter 580 is similar to our Model 550LU, but with a much larger pocket and a wider 3' shoe. This unit is designed to handle a broader rooted plant, such as daylilies. The Model 580 can be used as a single row or a multi-row system on a toolbar with rows as close as 22' apart. The Model 580 utilizes our positive spacing float wheel drive front hitch, which also prepares the soil in front of each unit. Positive action V-3 plant holders with special gearing for faster planting. Special 10' deep shoe with replaceable curved point. Quick- change spacing gears. 20' Coulter to protect the shoe 1 cushion seat is standard equipment.